Abd El-Gawad, E. M., Khalil, A. Z. and Balat, M. M. 1979. Genetic analysis of new breed of chickens. Egypt. J. Genet. Cytol. 8: 303-314. Abou El-Ella, N. 1982. A comparative study on the performance potentially of four locally developed strains and their F1 crosses. M.A.Sci. University of Alexandria, Egypt. Adedeji, T. A., Adebambo, O. A., Peters, S. O., Ojedapo, L. O. and Ige, A. O. 2006. Growth performance of crossbred and purebred chickens resulting from different sire strain in a humid tropical environment. Journal of Animal and Veterinary Advances 5 (8): 674-678. Adnan, A. A. M. 2003. Effect of diallel crosses on poultry performance. M.A.Sci., Faculty of Agriculture, Alexandria University. Alewi, M. and Melesse, A. 2013. Evaluating the growth performance of local kei chickens and their F1-crosses with Rhode Island Red and Fayoumi breeds in watershed areas of Guraghe administrative zone, southern Ethiopia. Tropical and Subtropical Agroecosystems 16: 39 â€“ 50. Broody, S. 1945. Bioenergetics and growth. Reinhold Pub. Crop., N.Y., U.S.A.
Dickerson, G. E. 1992. Manual for evaluation of selection theory in poultry. Genet. Today. 3: 747-761. Emmerson, D. A., Anthony, N. B. and Nestor, K. E. 1991. Genetics of growth and reproduction in the turkey. 11. Evidence of nonadditive genetic variation. Poult. Sci. 70: 1084-1091. Khalil, M. H., Hermes, I. H. and Al-Homodan, A. H. 1999. Estimation of heterotic components for growth and livability traits in a cross breeding experiment of Saudi chickens with white leghorn. Egypt. Poult. Sci. 19(3): 491-507. Laila, M. A., Goher, Mohamed,T. H. and Riad, S. A. 1996. Effect of crossing on body measurements, body conformation and dressing percent of some local and foreign breeds of chickens. Egypt. J. Agric. Res. 74 (2): 469-480. Mahmoud, T. H., Kosba, M. A., Hamdy, S. M. and Eturky, A. L. 1981. Hybrid vigor potency ratio in performance of crossbreds from four local breeds of chickens. 1- Body measurements and dressing percent. Agric. Res. Rev., Cairo. 59 (6): 197-198. Mandour, M. A., Abd-Allah, G. A. and Sharaf, M. M. 1996. Effect of cross breeding in some carcass traits of native and standard breeds of chickens. Egypt. Poult. Sci. 16 (1): 171-185. Mandour, M. A., Sharaf, M. M., Kosba, M. A. and El-Naggar, N. M. 1992. Estimation of combining ability and heterosis for some economic traits in local and commercial broiler strains of chickens from a full chilled cross. Egypt. Poult. Sci. 12; 57-78. Merat, P., Minivelle, F., Bordas, A. and Coquerelle, G. 1994 Heterosis in normal versus dwarf laying hens. Poult. Sci. 73 (1): 1-6. Ndegwa, J. M., Mead, R., Norrish, P. and Shephered, D. D. 2012. Growth Characteristics of Six Reciprocal Crosses of Kenyan Indigenous Chicken. Journal of Agricultural Science Vol. 4, No. 6. Padhi, M. K., Singh, B. P., Verma, S. V. S., Bist, G. S. and Singh, B. 1997. Combining ability analysis of meat quality traits in broiler chickens. Indian Journal of poultry science 32: 3, 296-300. Saleh, K. and Farghly, M. 1988. The effect of crossbreeding on growth traits in chicken. Com. Sci & Dev. Res., 22: 153-170. SAS. 2004. Statistical Analysis System, Statistical user's Guide. INT., Cary, NC. USA. Sheridan, A. K. 1981. Crossbreeding and heterosis. Anim. Breed. Abstr. 49:131â€“144. Sola-Ojo, F. E., Ayorinde, K. L. and Toye, A. A. 2012. A Comparative Study of Growth Performance and Feed Efficiency in Dominant Black strain, Fulani Ecotype chicken and Progeny from their Reciprocal Crosses. Asian Journal of Agriculture and Rural Development 2(2), pp. 120-125. Taha, A. E. 2005. Genetic variations among colored varieties of Coturnix. M.V.Sc. Fac. of Vet. Med., Alex. Univ. Egypt. Willham, R. L. and Pollak, E. 1985. Heterosis and crossbreeding. Dairy Sci. 68:2411â€“2417. Ye, X., Anderson, J. W., Noble, D. O., Zhu, J. and Nestor, K. E. 1997. Influence of crossing a line selected for increased shank width and a commercial sire line on performance and walking ability of turkeys. Poult. Sci. 76(10):1327-1331. Ayman El-Sayed Taha, Fawzy Ali Abd El-Ghany. Improving Production Traits for El-salam and Mandarah Chicken Strains by Crossing I- Estimation of Crossbreeding Effects for Growth Production Traits. AJVS. 2013; 39(1): 18-30. Ayman El-Sayed Taha, Fawzy Ali Abd El-Ghany. Improving Production Traits for El-salam and Mandarah Chicken Strains by Crossing I- Estimation of Crossbreeding Effects for Growth Production Traits. http://www.alexjvs.com/?mno=41249 [Access: April 18, 2019]. Ayman El-Sayed Taha, Fawzy Ali Abd El-Ghany. Improving Production Traits for El-salam and Mandarah Chicken Strains by Crossing I- Estimation of Crossbreeding Effects for Growth Production Traits. AJVS. (2013), [cited April 18, 2019]; 39(1): 18-30. Ayman El-Sayed Taha, Fawzy Ali Abd El-Ghany (2013) Improving Production Traits for El-salam and Mandarah Chicken Strains by Crossing I- Estimation of Crossbreeding Effects for Growth Production Traits. AJVS, 39 (1), 18-30. Ayman El-Sayed Taha, Fawzy Ali Abd El-Ghany. 2013. Improving Production Traits for El-salam and Mandarah Chicken Strains by Crossing I- Estimation of Crossbreeding Effects for Growth Production Traits. Alexandria Journal of Veterinary Sciences, 39 (1), 18-30. Ayman El-Sayed Taha, Fawzy Ali Abd El-Ghany. "Improving Production Traits for El-salam and Mandarah Chicken Strains by Crossing I- Estimation of Crossbreeding Effects for Growth Production Traits." Alexandria Journal of Veterinary Sciences 39 (2013), 18-30. Ayman El-Sayed Taha, Fawzy Ali Abd El-Ghany. "Improving Production Traits for El-salam and Mandarah Chicken Strains by Crossing I- Estimation of Crossbreeding Effects for Growth Production Traits." 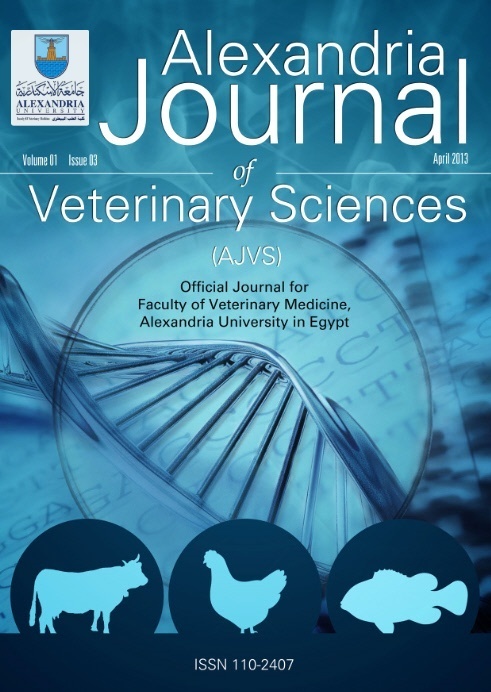 Alexandria Journal of Veterinary Sciences 39.1 (2013), 18-30. Print. Ayman El-Sayed Taha, Fawzy Ali Abd El-Ghany (2013) Improving Production Traits for El-salam and Mandarah Chicken Strains by Crossing I- Estimation of Crossbreeding Effects for Growth Production Traits. Alexandria Journal of Veterinary Sciences, 39 (1), 18-30.